The Composer Diversity Database allows conductors, performers, presenters, and researchers to expand and broaden their scope of musical repertoire and to discover a vast array of women, non-binary, Black, Latinx/Latin American, East Asian, West Asian/North African, South Asian, Southeast Asian, American Indian/Alaska Native composers from throughout history and around the world. Before accessing the databases on a mobile device, some users may have to “refresh” the page to enable the search form. Refreshing the page will also clear any selections previously entered into the search form. 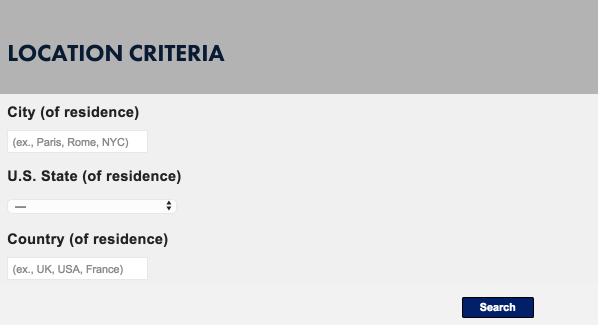 The Basic Criteria section focuses on three separate aspects: name, living/deceased, and women/non-binary. The name search allows for the user to search by full name or just first or last name. If neither “Woman” or “Non-Binary” are clicked, the search results will include all genders, including male composers of color (no white men are included in the database). Non-binary composers are only included if they have self-reported themselves to belong to that demographic. The Genre Criteria and Medium/Subgenre Criteria sections focus on the types of works that the composers within the database have written. Care has been made to include the most common large and chamber ensemble genres; more subgenres will be added over time. The genre/subgenre data within the database is either self-reported through our submission process or collected through analysis of composer websites or other online resources. While we encourage all composers to make any works they have currently list on their websites available for exploration, not every composer who is listed under a genre or subgenre may have works that database users may hear, see, or procure within that genre. The Demographic Criteria section allows users the ability to browse and search for composers within specific racial, ethnic, and cultural heritages. These searches are executed with a Boolean “or” process, which will expand the number of provided results. If there is a discrepancy with any of the information in this category for a composer, please send us an update with the form link at the top of this page. The Location Criteria section is extremely useful as it lets users search for composers from a specific country, a state with in the U.S., or even within any city from around the world. We encourage all conductors, performers, and educators to become familiar with composers in your region with this tool. The CDD Results page shows the names, locations, and website links to each composer selected. The search results page provides a number of different methods to order the results (name, city, state, country). Each search can be downloaded into a .csv or an .xml file. If you need to re-configure your search, simply click “Search Again” at the top of the page. To clear the search form of information previously entered, please “refresh” the page. The Wind Band Database Results page shows the composer’s name, work title, date of composition, duration, grade level, a link to the page where the work can be found/purchased, and the website links for the composer. In addition, audio and video links for each work are included if they exist and have been located. The search results page provides a number of different methods to order the results (name, title, date, grade, duration). Each search can be downloaded into a .csv or an .xml file. If you need to re-configure your search, simply click “Search Again” at the top of the page. To clear the search form of information previously entered, please “refresh” the page. The Orchestra Database Results page shows the composer’s name, work title, date of composition, duration, grade level (for educators), basic or detailed instrumentation, a link to the page where the work can be found/purchased, and the website links for the composer. In addition, audio and video links for each work are included if they exist and have been located. The search results page provides a number of different methods to order the results (name, title, date, grade, duration). Each search can be downloaded into a .csv or an .xml file. If you need to re-configure your search, simply click “Search Again” at the top of the page. To clear the search form of information previously entered, please “refresh” the page.